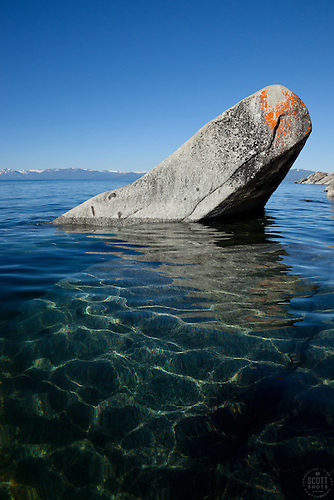 Boulders on Lake Tahoe, new photos from my kayak near Speedboat Beach. "Kayak on a Tahoe Boulder 2" - Scott Thompson's tandem kayak parked on a boulder near Speedboat Beach, Lake Tahoe. Two stand up paddle boarders can be seen in the distance. I love shooting photos of Lake Tahoe from my kayak. 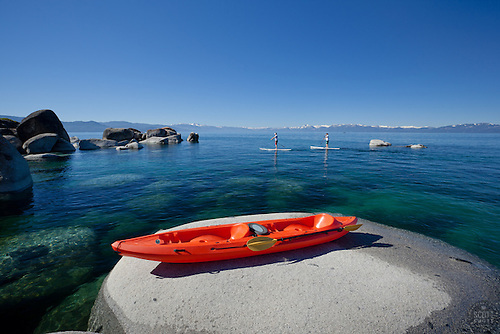 One of the best areas for this is the Speedboat Beach area in North Lake Tahoe, near the California and Nevada boarder. The boulders and beauty there provide for some incredibly peaceful moments as well as stunning photos. You can access Speedboat Beach with a car. There is a small amount of public parking and a path to a small public beach. But dragging a kayak down the path and stairs can be a big challenge, and on high lake level years like this year, there really isn't much of a public beach. I find the easiest way to access the area is to park and launch at the Kings Beach boat launch and paddle for about 10-15 minutes to Speedboat beach. You can't miss the boulders, they're everywhere, some more photogenic than others. I tend to get there before sunrise and my small headlamp is plenty strong enough to locate a good spot to catch the colors of the sunrise. From the kayak, I shoot sunrises handheld with no tripod so a high ISO is a must, usually around 800 with a wide aperture. A good camera like my Canon 5D MarkII can handle high ISOs decently, but I also tend to use a bit of Photoshop's noise reduction to clean the images up a touch. 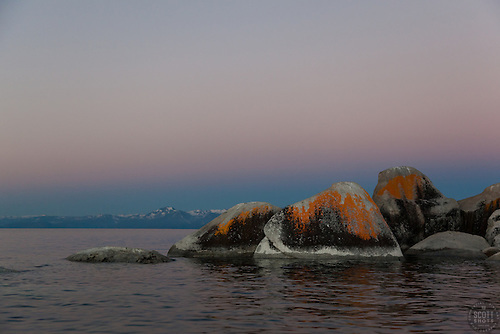 "Tahoe Boulders at Sunrise 7" - These orange, black, and grey boulders were photographed at sunrise from a kayak near Speedboat Beach, Lake Tahoe. A light amount of flash was used to get a good exposure of the boulders. I have previously written a bit of a "how to" on kayak photography so I won't go into too many details on that. You can find that post here: My Kayak, What a Great Photography Tool. 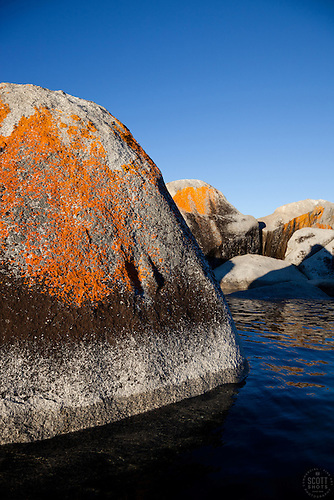 "Boulders on Lake Tahoe 18" - These orange, black, and grey boulders were photographed in the early morning near Speedboat Beach, Lake Tahoe. 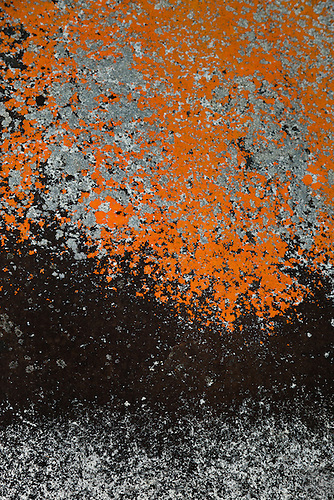 "Tahoe Boulder Abstract 1" - This abstract images is a photograph of a boulder near Speedboat Beach, Lake Tahoe. The lake level can really vary year to year and can really change the look of the area. With this year's high waters, I have been able to get into some areas and get photos that I could not last year. Bonsai Rock is a famous spot on Lake Tahoe for photography but I found this little bonsai like pine tree (below) near Speedboat Beach. I don't think the boulder made an "island" for it last year but I could be wrong. "Bonsai Tree on Lake Tahoe Boulder 2" - This little pine tree on a island boulder was photographed near Speedboat Beach, Lake Tahoe. 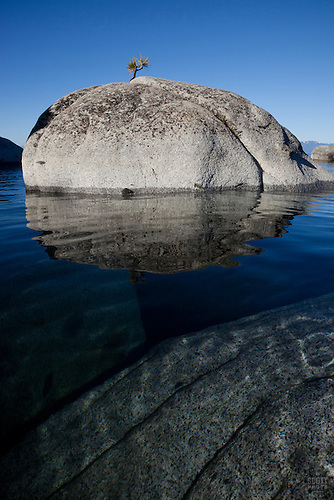 "Boulders on Lake Tahoe 24" - These boulders were photographed in the morning near Speedboat Beach, Lake Tahoe. Those are some of my favorites from my recent trip out to Speedboat Beach. But please enjoy this slide show below of many photographs from that area. Thank you! The Boulders on Lake Tahoe images above are available for purchase as large fine art prints, gift items, and as stock photography. Please click on an image for purchasing information. New Lake Tahoe Photo Gallery added. Yesterday I added a new photo gallery to my website. Well, actually I divided one gallery up into two galleries. I had a Lake Tahoe Sunsets and Sunrises gallery. Now I have a Lake Tahoe Sunsets Gallery and a separate Lake Tahoe Sunrises gallery. This is because I was getting too many images in the original gallery, a good problem to have. I've been out shooting even more Tahoe and Truckee sunrises lately, although it has been tough as the sunrise happens pretty early this time of year. Please view the photos below for a few favorites. 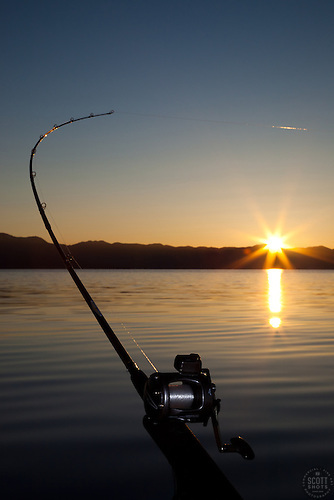 "Sunrise Fishing on Lake Tahoe 2" - This trolling fishing pole was photographed at sunrise on Lake Tahoe. One of the motivating factors for getting up so early lately has been fishing. I have a good buddy with a fishing boat and I often get the invite. As you can see, fishing and photography go very nicely together. 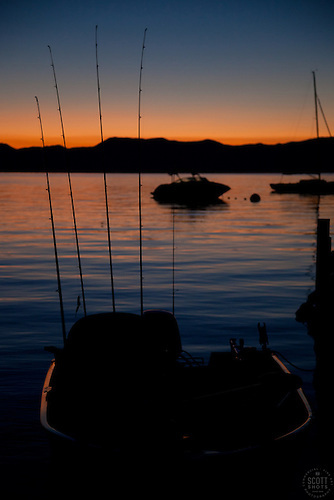 "Tahoe Fishing Boat at Sunrise" - This silhouette of a fishing boat and fishing poles was photographed at sunrise on Lake Tahoe. The boat is my fishing buddy's boat and I have spent many hours fishing and taking pictures of Tahoe from it. The fishing boat was loaded with gear and coolers, and the silhouette worked great to hide it all. 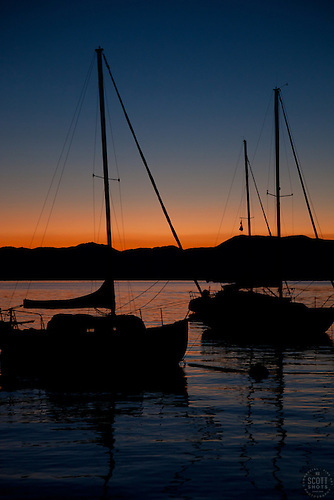 "Tahoe Sailboats at Sunrise" - These silhouettes of sailboats were photographed at sunrise on Lake Tahoe. I captured this one from the dock, right as we were about to head out fishing for the day. 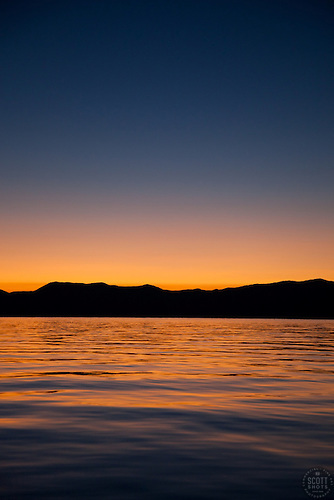 "Sunrise at Lake Tahoe 7" - This sunrise was photographed from a boat on Lake Tahoe. As we were heading out of the buoy zone, the boat was moving slow so I was able to capture a few photos of a fiery but near cloudless sunrise. 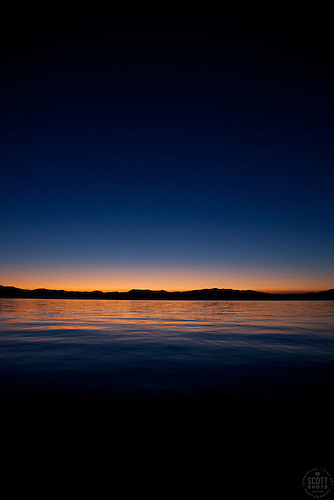 "Sunrise at Lake Tahoe 6" - This sunrise was photographed from a boat on Lake Tahoe. Taken at about the same time as the photo above, I zoomed out to the widest angle my 24-105 mm lens could go. I like this one a lot for the simple and abstract feel to it. I've previously written a bit of a "how to" when it comes to photography from a small fishing boat on Tahoe. You can view the post here: Fishing and Photography on Lake Tahoe If you have any technical questions about the subject, please feel free to ask in the comments area below. Thank you! The images above are available at Fine Art Prints, Gift Items, and as Stock Photography. Please click on an image to view it larger and for purchasing info. All of the Scott Shot's Tahoe area photographs can be found in the Lake Tahoe and Truckee Areas gallery collection.